Done Deal: The Boston Red Sox and outfielder Jacoby Ellsbury successfully avoided arbitration this week as the two sides came to terms on a 1 year deal worth 9 million dollars. Ellsbury missed most of last season with a shoulder injury that kept him sidelined for 79 games. Ellsbury will look to bounce back this year and put up numbers like he did for Boston back in 2011. In 11′ he finished runner up in the MVP race with a .321 AVG, 32 HR, 105 RBI, and a .928 OPS. 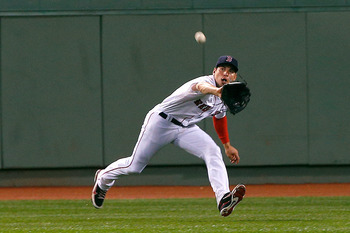 Ellsbury will join a Sox outfield that will include off-season acquisitions Jonny Gomes and Shane Victorino. Final Thoughts: Signing Ellsbury to avoid Arbitration was a great move by Boston. It shows Ellsbury that the clubhouse will be willing to negotiate a bigger payday at seasons end (which is when Jacoby becomes a free agent). Which in turn, should have Ellsbury feeling good and ready to put up big numbers again. The biggest key for Jacoby, as we all know, is just to stay healthy in 2013. What do you think? Will Jacoby bounce back this year? Can he stay healthy to play a full season? Leave a comment below.